From The Lion King to Moose Murders and from Cat on a Hot Tin Roof to Agatha Christieʼs The Mousetrap, celebrate the Drama Desk Award-winning artwork of Frank "Fraver" Verlizzo with more than 250 of his theatre poster designs from Broadway, Off-Broadway, and around the globe. 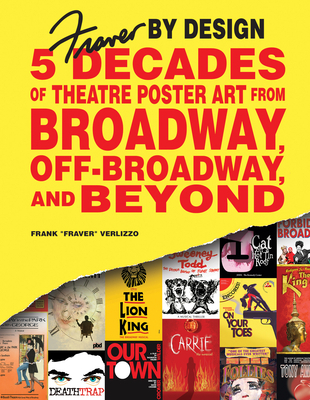 For the first time in his five-decade career, this monograph collection will take you behind-the-scenes into the world of theatrical advertising through a rare look at 40 unpublished poster sketches for some of Broadway's favorite shows, hilarious career anecdotes, and commentary from theatre icons, including Bernadette Peters, Dean Pitchford, and Jack Viertel. More than 20 of Fraverʼs poster designs for the works of Stephen Sondheim are spotlighted, as well as those created for Rodgers & Hammerstein, The Kennedy Center, and New York City Centerʼs Encores series. This is the perfect collection for students and fans of the theatre, graphic design and advertising, and the arts in general. Frank "Fraver" Verlizzo has created poster art for more than 300 productions including The Lion King, Deathtrap, and Sweeney Todd. Playbill has called him, "the theatre poster legend."